Home > Latest > Lifestyle > 5 Benefits of Standing Desk!! Sitting too much can kill you. It sounds dramatic, but it’s true. Sitting behind your desk all day is bad for your health and experts to have long been advising people to stand at their workstations for about 15 minutes an hour. But a University of Waterloo professor says his research shows that people should be standing for at least 30 minutes per hour to get health benefits. People who sit a lot every day have an increased risk of diabetes, heart disease, and early death. Additionally, sitting all the time burns very few calories, and many studies have linked it to weight gain and obesity. 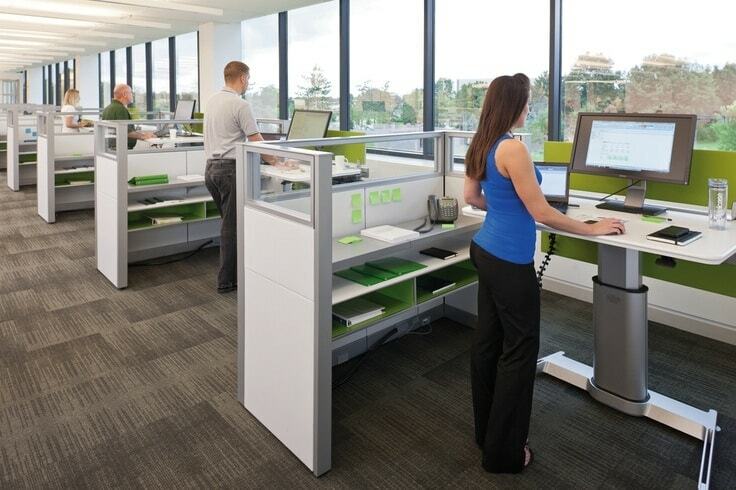 However, is this standup desk trend as healthy as sitting is unhealthy? Given a rash of studies that purport sitting is the cause of all your health and weight problems, it’s easy to think so. But recent research suggests standing desk benefits may not be all they’re cracked up to be. A standing desk, also called a stand-up desk, is basically a desk that allows you to stand up comfortably while working. A standing desk is a desk tall enough that the user can work at it while standing upright. It is popular with many modern computer users and tech industry professionals. The standing desk is not a new invention, however, having been used at least since the time of Leonardo Da Vinci. Read also Back Pain or Neck Pain? Try changing your Keyboard and Mouse. While there are no medically proven health benefits of using a standing desk, standing while working may improve blood circulation, which can heighten mental focus and increase productivity. A variation of the standing desk is the height-adjustable or sit-stand desk, which allows the user to quickly change from a seated to a standing position while using the same desk. Here are 5 benefits of Standing Desk!! The more your blood sugar levels increase after meals, the worse it is for your health. This is especially true for those with insulin resistance or type 2 diabetes. In a small study of 10 office workers, standing for 180 minutes after lunch reduced the blood sugar spike by 43% compared to sitting for the same amount of time. Both groups took the same amount of steps, indicating that the smaller spike was due to standing rather than additional physical movements around the office. The harmful effects of sitting after meals could help explain why excessive sedentary time is linked to a whopping 112% greater risk of type 2 diabetes. The idea that standing is better for heart health was first proposed in 1953. Scientists have developed a much greater understanding of the effects of sitting on heart health, with prolonged sedentary time thought to increase the risk of heart disease by up to 147%. It is so harmful that even an hour of intense exercise may not make up for the negative effects of an entire day spent sitting. Back pain is one of the most common complaints of office workers who sit all day. To determine if standing desks could improve this, several studies have been done on employees with long-term back pain. Participants have reported up to a 32% improvement in lower back pain after several weeks of using standing desks. Standing desks appear to have a positive influence on overall well-being. In one 7-week study, participants using standing desks reported less stress and fatigue than those who remained seated the entire workday. Additionally, 87% of those using standing desks reported increased vigor and energy throughout the day. Upon returning to their old desks, overall moods reverted to their original levels.